Reach far into the interior of bowls with ease with these 4 invaluable tool rests. These comfortable, ergonomically designed tool rests that will provide you all-day turning support. With the unique concave design, your fingers will fit snuggly on the rest and let you get closer to your work. The ultra smooth, round hardened steel top let will let you effortlessly glide your lathe tool for superior results. All rests have hardened rods welded over 5/8 in. curved barstock 4 in. long top to bottom. S Curved Torres, 9 in. span. 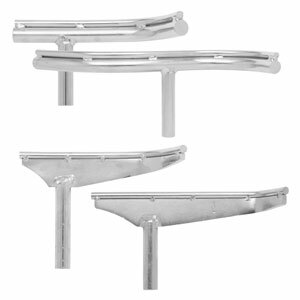 Use the S curved tool rest for exterior and interior hollowing. 3-3/4 in. long top to bottom. 2-1/2 in. Radius curved tool rest, 6-3/4 in. span. Use the 2 1/2 in. radius curved tool rest for exterior and interior hollowing. 3-3/4 in. long top to bottom. 2 in. radius curved tool rest, 6-1/2 in. span. Use the 2 in. radius curved tool rest for exterior and interior hollowing. 4 in. long top to bottom. 1-1/2 in. radius curved tool rest, 8 in. span. Use the 1-1/2 in. radius curved tool rest for interior work, deeper penetration and sharper corners inside the bowl. 4" long top to bottom. Rod will not nick or scratch giving it a long life. 3 piece Tool Rest set for Full Size Lathes. This modular tool rest set allows you to quickly change your tool bar length in a matter of seconds with ease. 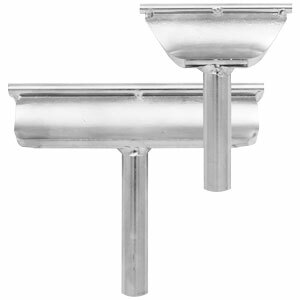 The chrome plated steel tool bars are designed so your tools glide smoothly when moving side to side. 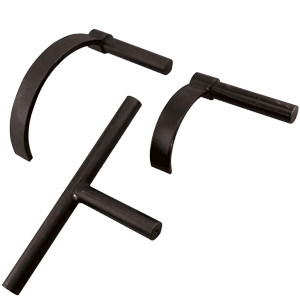 The set includes 4 different length tool bars and 2 different size post to give you 8 different sized tool rests. wether your working on a large or small project, you will have the right size tool rest at hand. The T-Bar Modular Tool Rest System gives you the ability to interchange tool bars (tool bars & posts sold separately) on to any of the tool posts in the Modular Tool Rest System. This means that you can have multiple posts for different lathes in your shop and simply change the bar (tool bar sold separately) to the one that you need for any application. 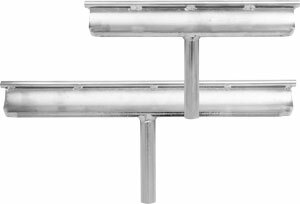 These high quality tool bars feature a 3/4" round guide bar made from super strong precision ground polished alloy steel for vibration free turning. The round design offers the smoothest surface possible for gliding your tools over your project. Wood turners who have used this system say its absolutely the best they have ever used. Choose your post based on your lathe make & model. 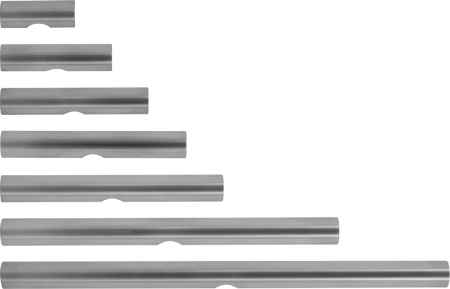 Choose your bar based on your turning needs. Each tool bar will fit any of the posts above. The 1" diameter Super Long Bars come with a larger brass adapter to properly distribute the weight. This is the perfect Tool Rest for making flat bottom boxes. Machined from solid steel this is the strongest Tool Rest of this type available anywhere. Fits all Modular Tool Posts. Comes with Brass Washer to help absorb vibration and is finished with Black Oxide. 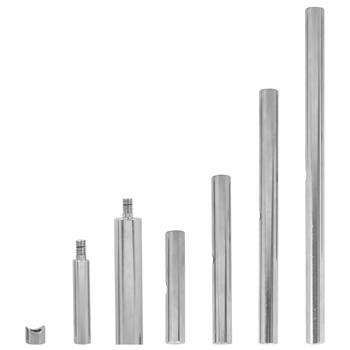 Extends 3-1/2" into your workpiece. Can also be used for scraping on any outside surface of your work. Extends 4" into your workpiece.